It's been another exciting year on the shoegaze and psych rock circuits. While two of the scene's most reverential acts Ride and Slowdive have road tested new material and announced the imminent arrival of a new album respectively, fellow influential outfit from back in the day Lush returned, released a new EP, played a batch of critically acclaimed shows, but now appear to be gearing up for their last ever performance later this month after the departure of bass player Philip King. Elsewhere, established bastions of the scene The Brian Jonestown Massacre, Nothing, and The Warlocks all released impressive long players, while rising stars The Lucid Dream and Flyying Colours continued their ascent putting out impeccable albums of their own. However, the emergence of numerous new artists and labels has also ensured 2016 goes down as a year to remember. Homegrown imprints like Wrong Way Records have put out a handful of excellent releases (a couple of which are featured here) while newcomers from as far afield as Italy (Parma's My Invisible Friend) and Belgium (Antwerp's Newmoon and Few Bits) have been responsible for some of this year's finest music. So without further ado, here's 25 artists we've been getting into a lather about over the course of this year. This Portsmouth-based trio recently signed to esteemed independent Club AC30 and release their debut EP Velvet Dreams later this month. Fusing the soundscapes of early Verve with reverb-fuelled delirium in the vein of Ride or Chapterhouse. This is 'Ocean Blue', taken from the forthcoming EP. Although not strictly a new release as such, shoegaze luminaries The Early Years reissue their self-titled debut on 11th November to commemorate its tenth anniversary. Released as a limited edition pressing of just 300 copies on transparent orange wax vinyl, it's an essential addition to anyone's collection as well as providing a timely reminder of its creators' wares. Here's 'All Ones And Zeros', the band's second single from 2006. Having established himself as one of the most forward thinking musicians in the ambient scene, Ulrich Schnauss releases his fifth long player this week (4th November). No Further Ahead Than Today is an ethereal, beat-laden collection electronically based musings and soundscapes that further enhances his already prestigious back catalogue. Leeds based four-piece Wuzi might be a new name on the scene, but they're already making waves wherever they go. Having landed a prestigious slot at Toronto's Indie Week festival later this month by winning the unsigned band competition at its sister event Indie Week Europe, the next few months look very promising indeed. They released debut EP Atomis in October, produced by Matt Peel whose recent work includes the Autobahn and second Eagulls LPs. Combining the intensity of Radiohead with effects laden guitars and occasional bursts of noise, they're definitely ones to watch out for. Gothenburg duo Pink Milk may have come to light last year via their dreamy reworking of Foreigner's 'I Want To Know What Love Is', but recent single 'Detroit' proves they're a force to be reckoned with when it comes to penning their own stuff too. Comparisons to The Raveonettes, The Jesus & Mary Chain, and Dum Dum Girls aren't wide of the mark as I'm sure you'll agree when listening to the aforementioned 45. Palermo musician Manfredi Lamartina also goes under the moniker of Novanta, and his new album Hello We're Not Enemies might well be his finest release to date. Featuring numerous collaborators including Ian Bonnar (In Every Dream A Nightmare Waits), Giuseppe Musto (Il Ragazzo Del Novantanove), and Giampiero Riggio (Haas). Hello We're Not Enemies is a heady mix of shoegaze, post-rock, and electronica that ventures beyond the conventional realms of each. This Berlin based outfit released their debut album Cascades in May and cite Interpol, Hawkwind, and The Sisters Of Mercy among their influences. However, upon hearing the likes of lead single 'Do Or Die' or its follow-up 'Intuition Unbound', it's clear to see there's a wealth of ideas here culminating in a sound that's beyond definition but definitely psychedelic in practice and execution. Having initially formed in 1995, Seattle outfit The Emerald Down can boast as being one of the first bands to embrace the second wave of shoegaze. Debut album Scream The Sound came out in 2001 and is scheduled for re-issue later this month, while an album of new material entitled Songs From Saturn is set to be released on Wrong Way Records in the early part of 2017. This is 'Perilized', taken from their long out of print but soon to be re-pressed debut. Belgian five-piece Newmoon might be massive Elliott Smith fans, but their dreampop opus Space has more in common with the likes of Mew, Slowdive, and The Jesus & Mary Chain. Formed three years ago in the suburbs of Antwerp and Ghent, Space marks the culmination of their earliest forays into songwriting and ranks among 2016's finest debuts. This is recent single 'Helium'. Hailing from Parma in Italy, noise infused four-piece My Invisible Friend hit the ground running in September with their self-titled debut EP. Released on Fuzz Club Records, it fuses melodic textures with effects heavy sonic assaults that make them one of the most exciting new prospects on the circuit at the minute. This is 'Endless', arguably the standout track on the aforementioned EP. This Edinburgh-based outfit have been honing their wares for a decade now. Having released debut album The Average Can Blind You To The Excellent back in 2010, they've steadily put out a handful of records over the past couple of years culminating in the excellent Since I Was Fifteen EP, released last month on Wrong Way Records. Finnish krautrock noiseniks Teksti-TV 666 have emerged as one of the most innovative, not to mention exciting, live acts in their native land. Having released three EPs to widespread critical acclaim, Svart Records are putting out a compilation this month (7th November) of those three releases entitled 1, 2, 3. Compared to Neu! performing Ramones songs, or a shoegaze Hellacopters, they're one of the most original acts to break from the scene in a very long while. Regular readers of this column will no doubt already be aware of Whistlejacket. However, the South London outfit have been away for a while developing their sound culminating in September's excellent Oh Brother EP. Released on Fierce Panda, it reveals a heavier, more frenetic side to their make-up, and one that makes the band's forthcoming as-yet untitled debut album a mouth watering prospect indeed. Southampton psych rockers Dead Rabbits have been making a name for themselves in recent years both on the live and recorded front. 2013's debut The Ticket That Exploded alerted Fuzz Club Records to their considerable talents, and its follow-up a year later Time Is Your Only Enemy further established their credentials. Album number three Everything Is A Lie came out in September and boasts their finest collection of songs to date. This is 'All Your Little Lies', taken from the new record. Having initially formed in Brisbane back in 2010, doomy psych rockers Bonfire Nights moved to London the following year. Once over in the UK, they put out a couple of singles before finalising Entopica Phenomica, their debut long player released last month on Holy Beatnik Records. Leeds outfit New Horror channel the spirit of both early 80s post-punk and the halcyon days of Creation Records on Fruitless Search, their debut EP released in August on the band's own imprint Soft Verse. Elements of The Cure, The Scars and The Jesus & Mary Chain all spring to mind, as do the likes of Spacemen 3 and Loop when the going gets really heavy. 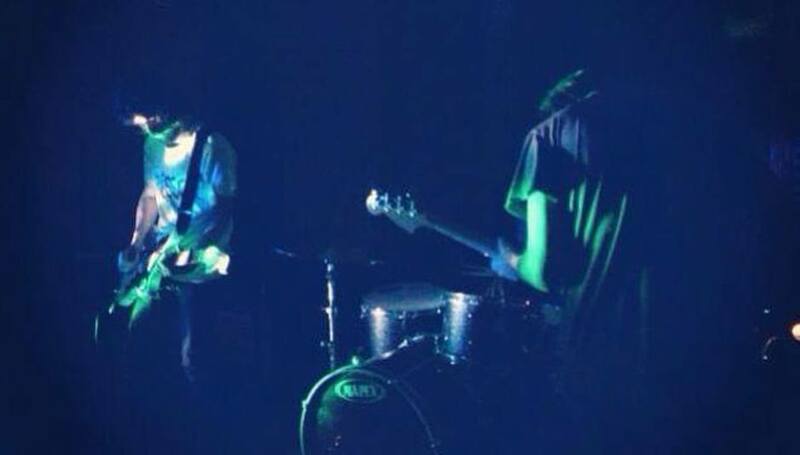 Hailing from Portland, Oregon, Vibrissae are a multi-national three-piece that specialise in shoegaze influenced electronica, with vocalist Imber Lingard and musical accompanists/husband and wife Aaron and Emma Bell (not related) coming from Australia, the USA, and Malaysia respectively. Debut LP Somewhere Away came out in August on Italian imprint Vipchoyo Sound Factory, and ranks among the year's most impressive releases. Having witnessed his live show a couple of times in recent weeks, we're already huge fans of one man band TVAM and his audio visual extravaganza. Essentially the guise of Mancunian composer and musician Joe Oxley, his debut album is currently being readied for release next year. In the meantime, new single 'Total Immersion' comes out on 25th November and its Suicide meets Add N To X motorik electronica makes it one of 2016's most addictive 45s. Eyes Behind The Veil is the solo project of Chicago based musician Michael Tenzer. Fusing ambient soundscapes with post-rock signatures and layered effects for a unique aural experience. His second album Empathy came out on Hush Hush Records in July and is reminiscent of artists like Hammock, Grouper, and Robin Guthrie whilst retaining an identity of its own. With more new music due in the new year, Tenzer is definitely a name to watch out for. In the meantime, sit back, relax and enjoy. Another band hailing from the Belgian city of Antwerp are Few Bits, a six-piece who've been crafting succulent, occasionally ethereal, but also quite edgy dreampop since 2013. Second album Big Sparks came out in October and expands upon the blueprint cast by their self-titled debut three years earlier. Highly regarded Mexican duo Lorelle Meets The Obsolete released their long awaited fourth LP Balance in September, and as expected it's every bit as good as its predecessors. Fusing numerous elements of the psychedelic canon with shoegaze overtones, it represents another fine addition to the near flawless Sonic Cathedral catalogue. Here's the title track in all its breathtaking glory. The multi-talented Keith Canisius returns this month with his first collection of new recordings in four years. We Are The Dreamers comes out on 11th November through Darla Records, fusing Canisius' inimitable melodies and vocal style channeled through reference points from Ennio Morricone to the Cocteau Twins and beyond. Here's 'We Gotta Get Going', taken from the record. Chicago's Grimble Grumble have been around in various guises since 1995, dissolving briefly in 2000 before regrouping again four years later. Having released three albums in that time - the last of which September Sun came out in 2011 - they're currently in the process of finishing record number four. In the meantime, here's a brand new composition entitled 'Make Believe Song' taken from a recent compilation twelve-inch Volumes that came out on Picture In My Ear Records last month. We've been big fans of Istanbul based quartet The Away Days since first single 'Your Colour' dropped in the early part of 2014. Since then, they've put out two more 45s and an EP, with an album due to follow in 2017. Here's the first fruits of that venture in the shape of current single 'World Horizon'. London based trio Muertos straddle the psych rock/garage punk axis like a modern day Cramps put through a Death By Audio blender. Having garnered a reputation for their explosive live performances, rising imprint Wrong Way Records release their self-titled debut EP on Friday (4th November) and its among this year's finest of that ilk.